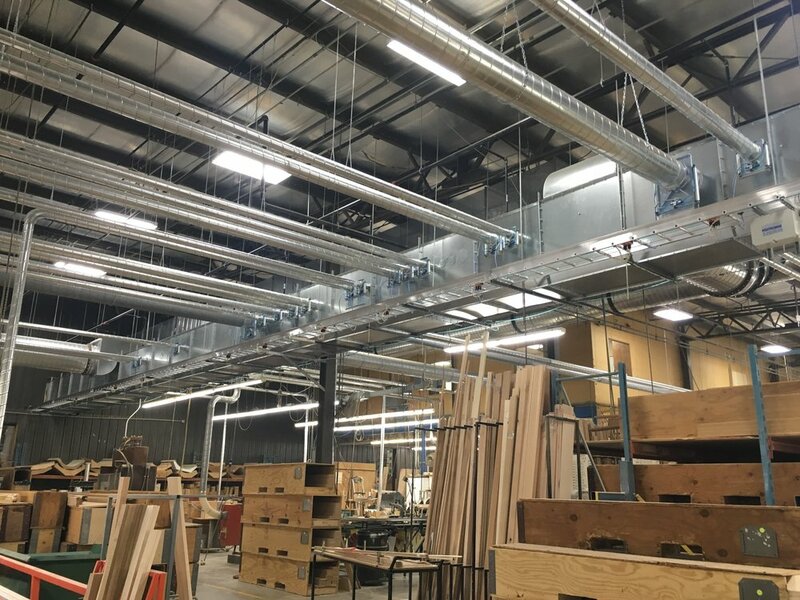 Replacing an antiquated dust collection system with a Höcker system unique to North America is paying off big dividends in energy savings and productivity gains for the Minnesota-based custom cabinet manufacturer. Crystal Cabinet Works Inc. has a long and proud heritage of manufacturing custom cabinets one kitchen at a time including not only the boxes, but the doors and drawers as well. In its never-ending pursuit to be more efficient and profitable, the Princeton, MN, company – celebrating its 70th anniversary this year – runs a continuous process improvement program. Crystal Cabinet’s engineers are always on the prowl to identify and eliminate the biggest production bottlenecks that hinder its ability to cost-efficiently deliver what the customer wants when she wants it. One of the bottlenecks that was identified several years ago was the plant’s aging dust collection system, a hodge-podge of six collectors purchased from four different companies, the newest installed about 25 years ago. “Basically, as our production grew and our dust collection needs grew, we added accordingly,” said Jared Nierengarten, maintenance manager for Crystal Cabinet. The resulting un-orchestrated dust collection ensemble, with a combined 650 horsepower (hp), steadily became less efficient, succumbed to air leaks, gobbled up energy and represented a major obstacle every time Crystal Cabinet looked to add or move equipment. Yet, in spite of these glaring dust collection issues, Crystal made due choosing instead to earmark its capital expenditure budgets to purchase new machinery that not only filled a current need but came with a more calculable return on investment. For example, a Biesse Winstore automated panel management system that eliminated building bunks of material for a day’s production by hand, aced out tackling the dust collection conundrum a few years ago. Crystal Cabinet’s search for a better and more technologically advanced dust collection system finally began in earnest in 2014. More than two years later, in December 2016, Crystal Cabinet officially put that nagging production impediment to bed when it fully commissioned a pair of Hocker Polytechnik dust collection systems acquired from Hocker North America. In a North American first, each of the dust collectors incorporates a unique conveyor that streamlines dust collection hook ups to individual machines. In addition, each machine has its own dedicated blast gate which only opens when the machine is in operation. These features combined with other efficiencies of the Hocker systems dramatically reduce energy consumption as exemplified by a $71,000 energy efficiency rebate Crystal Cabinet recently received from Connexus Energy. “We were always looking for those types of savings but I always viewed dust collection as a necessary evil,” Nierengarten said. “We were very pleased to see the words ‘energy management system’ tied to anything that had to do with dust collection. Crystal Cabinet employs about 450 people and operates 6 a.m. to 3 p.m. five days a week supplemented by a skeleton second-shift crew. The regular weekly output is 1,500 to 1,800 cabinets, available with or without frames. The company’s 270,000-square-foot plant is comprised of three main sections. Production machinery occupies the north and south sides of the building with the finishing department sandwiched in between. The facility’s size and layout necessitated Crystal Cabinet to install separate Hocker dust collection systems in each of the production departments. The north side of the building is home to the Biesse Winstore that feeds panels to three Biesse CNC nesting routers, as well as most of the plant’s heavy-duty panel processing and sanding equipment. Included are multiple stations for orbital hand sanding of cabinet doors, the number one generator of dust in the plant, Nierengarten said. The Hocker dust collector servicing the north hall has eight independent 50-hp motors. While it is capable of achieving a total airflow velocity of more than 120,000 cubic feet per minute (cfm), it is rare that enough blast gates are open to require more than half of the motors’ output at any time. The south side dust collector has three 30-hp motors and a capacity of just over 30,000 cfm. If they were laid end to end, the duct pipes of the two new dust collection systems would extend “well over two miles,” Nierengarten said. Crystal Cabinet has about 150 different pieces of equipment – everything from hand sanders and chop saws to widebelt sanders and CNC routers. Each machine has its own dedicated duct piping and blast gate and connects perpendicularly to the overhead dust chain conveyor system that runs from one end to the other of each machine department. “The conveyor system, though new to us, was a no brainer,” Nierengarten said. “It’s a very simple concept. When a piece of equipment generates dust, it gets sucked into the chain conveyor where it loses its velocity due the conveyor’s chamber being larger than the dust pipe. The larger particles settle to the bottom and get conveyed and scraped into a centralized airlock. The large and small particulates get reunited in an exterior silo. Typically every Wednesday four 40-yard dumpsters of sawdust get hauled away for use as animal bedding, Nierengarten said. One of the most significant benefits of the new conveyor system is that it dramatically simplifies the movement of machines. Since each machine has its own piping and blast gate, it’s just a matter of unhooking the ductwork from the conveyor and plugging it in somewhere else down the line. In addition, each machine has a unique IP address that ties into the Hocker dust collector’s CAN bus system via a network cable that runs alongside the conveyor. When a machine that has been moved is turned on, the Hocker’s main computer immediately knows its new location and its cfm needs. To put the Hocker’s energy savings in perspective, Rask and Nierengarten tag-teamed on a before and after illustration. “With our old system, we turned on 650 horsepower at 5:30 in the morning and we wouldn’t turn it off until 3:30 or 4:00 in the afternoon,” Rask said. “And the system would run all the way through all 150 pieces of equipment during that entire time. Ben Dipzinski of Hocker North America, exclusive U.S. representative of Höcker Polytechnik, said the conveyor system is a major contributor to Crystal Cabinet’s energy savings. “The conveyor system minimizes the amount of air velocity that is required to move wood dust down a trunk line. The motor that drives the conveyor’s drag chain is less than 1 horsepower. It would take a minimum of a 60-horsepower motor to provide the minimum air velocity to extract all of the dust. The $71,000 rebate check from Connexus Energy was based on the dust collector’s estimated ability to reduce energy consumption by more than an estimated 1 million kilowatt hours each year. According to Connexus, the annual energy savings is equivalent to meeting the electricity needs of 94 average U.S households, 562,023 dishwasher cycles or brewing 3,831,933 pots of coffee. From an environmental standpoint, the energy consumption reduction equals saving 1,236,225 pounds of C02 or 24,725 trees needed to absorb that amount of CO2. The new system is also in compliance with the new NFPA 652 combustible dust rule, Rask said.